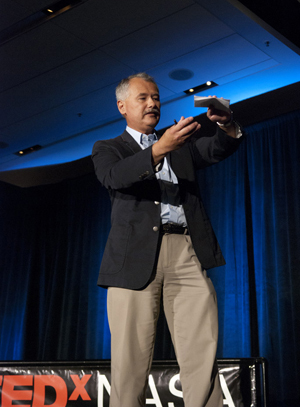 Watch Al’s TEDxNASA presentation, “Toward More Bird-Like Flight: Thinking Outside the Box,” here. An incredible amount of work was done by the NASA Ames folks putting on their first TEDx event, and the NASA Langley TEDx crew did an equally incredible amount of work in support of the event, helping out and getting everything spooled up. There were a number of NASA Dryden folks helping out as well; many kudos and thanks to everyone who was doing a lot more than pulling their own share. Image left: Al Bowers takes the stage for his 8 minutes of fame at the recent TEDxNASA event in San Francisco. Image courtesy Michael Porterfield. Wow, TEDxNASA. What an event. In the lecture/conference world, the TED name (stands for Technology, Entertainment, and Design) has huge gravitas. And it is well deserved. Some of the most mind-blowing ideas have been presented in a public forum at TED, and to put all those great ideas together in one place like TED does is simply amazing beyond words. TEDx is the way TED shares their ideas worth spreading with a broader audience. Bravo! So I knew what TED was before I was asked to be a TEDxNASA speaker. And when the question came up of who should speak for NASA Dryden, the fact that my name got mentioned was a huge compliment and honor. To be honest, I view myself as a pretty regular person. Not very noteworthy, and having little to add to a thought or conversation. But once in a great while, a few times in my life, I’ve had these glimpses of incredible insight. I could see connections between GREAT ideas from the great thinkers that I’ve read about, and thought about their ideas. And suddenly I can see how these amazing ideas work in the vision of my mind. So TEDxNASA was an opportunity to share one of the really big ideas that I was able to grasp. I chose the last paper by Ludwig Prandtl on the spanload of wings. Prandtl was the founding father of the science of aeronautics. His formulas were the first practical tools by which we could calculate lift, induced drag, and spanload – the distribution of load across a wingspan. John Anderson, the great professor of aeronautics and noted historian, speaks of how Prandtl should have won the Nobel Prize for Physics because of his contributions to aeronautics. And I completely agree. Prandtl’s last paper on spanload and induced drag has languished, almost completely unnoticed, and would be not even a footnote were it not for two brothers who used his idea to build a few wooden gliders and sailplanes. These two brothers, Reimar and Walter Horten, built some of the most beautiful man-made aircraft to ever fly – pure flying wings. The Hortens had to integrate all the components of flight into a single unit, and eliminate everything that did not contribute to their singular idea. Prandtl’s last paper on spanload was the germ of that idea. 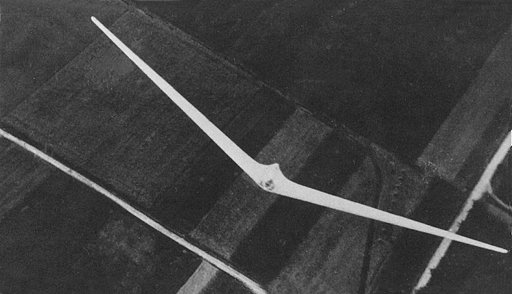 Image right: The Horten H VI sailplane, built by Reimar Horten.Image courtesy Doug Bullard. Many years ago, I had the great honor to listen to Bob Hoey, the retired Edwards Air Force Base engineer. Bob had been studying the flight of birds. And Bob was talking about the spanload of birds and how, if you got it wrong, nothing worked, but if you got it right, everything worked. Bob didn’t know about Prandtl’s last paper, or details of the Hortens’ work. But I did. And suddenly I connected the dots between them, realizing how Prandtl’s idea could solve the three great problems of aircraft in a single integrated solution: maximum performance (that is, minimum drag for maximum efficiency), minimum structure (if you’re limited in structure, what is the wing that is optimum? ), and controlled coordinated flight (minimizing the added clutter of control surfaces we take for granted). And I could see the connection between Prandtl with his ideas, the Hortens with their sailplanes, and Hoey with his birds, and everything came together. Graphic at left: The elliptical spanload (dashed line) and the bell spanload (solid line), with the centerline at the left and the wingtip at the right. 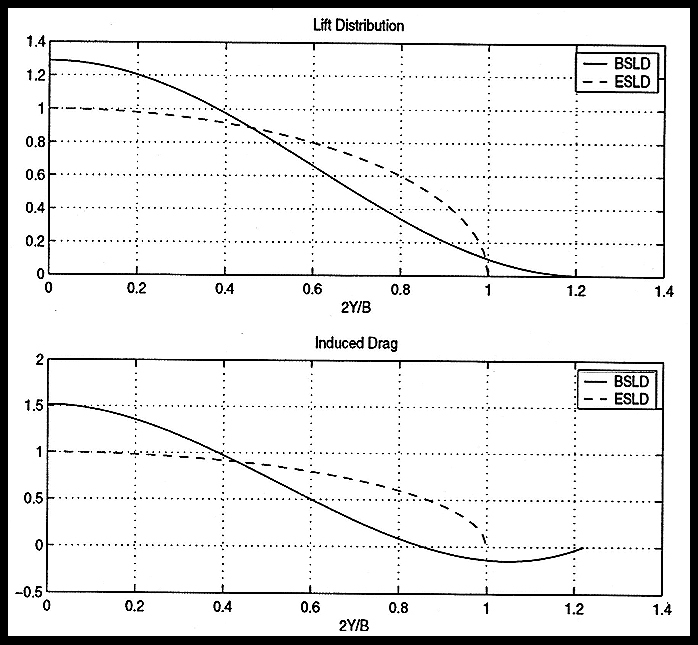 At the top are the spanloads, and at the bottom are the induced drag curves (note the bell spanload induced drag goes negative at the wingtip). TEDxNASA@SiliconValley was in San Francisco, near Moscone Center. It was tagged on the end of the IT Summit, so there was a certain amount of teardown activity for the summit and buildup for TEDxNASA going on. We had our pre-meeting for the speakers, and that was our first walk-through of the venue and familiarization with where the Green Room was, when we needed to be where, the final details on the schedule, and the real indoctrination of what it means to be a TEDx speaker. All the folks doing the prep were running around in these cool black TEDxNASA shirts. All of us speakers were sort of milling around in the middle of this huge hubbub of people running to make things happen. And then, it started. The first few speakers gave their talks. Things were going pretty well. We had the usual GLITCHes (GLITCH = gremlins living in the computer hardware), but the presentation was moving very well. It was time for me to get ready. Now, I have a confession to make. The worst time for me, for any talk I give, is the last five minutes before I walk out to start talking. I am a total nervous breakdown, train-wreck of stomach-churning, introverted, hands-shaking nerves. I know none of you believe that of me, but it’s true. And then I walk out on stage, and I start, and suddenly…the moment flows. I can connect with people; I can open their mind’s eye to new ideas, to concepts that are really the secret truths of the universe. For a moment, this frail, failing, human mind of mine can do that with others. Wow. It’s over. Is it really over? Did I get all my ideas in? Was it okay? Faces are coming up to me to shake my hand and congratulate me. Friends are giving me the thumbs-up, slapping me on the back and saying how great I did. Really? Did I do that? Everyone smiles at me. I sit down again and listen to the other speakers. Ilan Kroo (Stanford professor) comes up, says I need to present the derivation to his graduate students. (Wow! Really?) My wife walks me back to our hotel room. I’m in too much of a daze to do anything; it’s a good thing I didn’t have to drive. The days pass. Life returns to “normal.” The video is posted now. The talk is not perfect (not by a long shot). But it’s good. I’m glad the idea – Prandtl’s idea – is being talked about.